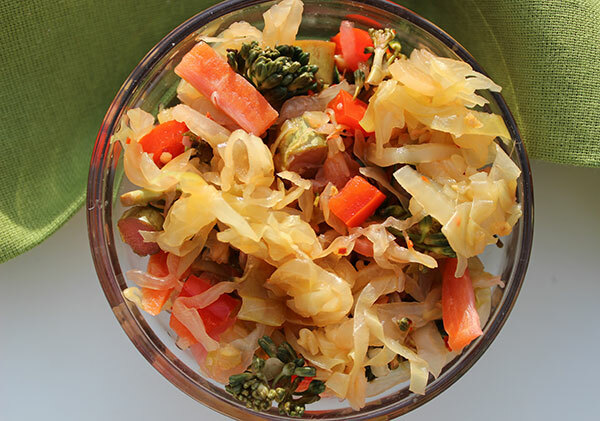 This cultured vegetables recipe is one of our go-to favorites that blends the wonderful chopped cabbage leaf with some basic but colorful vegetables: red pepper, broccoli, carrot, kale, red onion as well as the spicy daikon radish root. Although the color will fade some after the fermentation process, the end result provides a nice blend of textures and pickled sweet flavors. 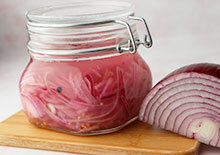 If you've arrived on this page, you most likely are familiar with the lacto-fermentation process of pickling vegetables. This is a raw unheated unpasteurized way to naturally ferment raw vegetables in a brine liquid. Packed in a safe oxygen-free lactic acid environment, over a period of days these chopped veggies will naturally develop a pickled state that does not require canning or high heat methods. 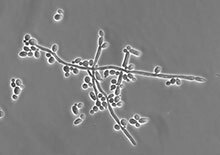 Unlike other food preservation or pickling techniques, this creates an enzyme active food packed with these beneficial microbes, organisms that can help to maintain healthy gut bacteria levels. 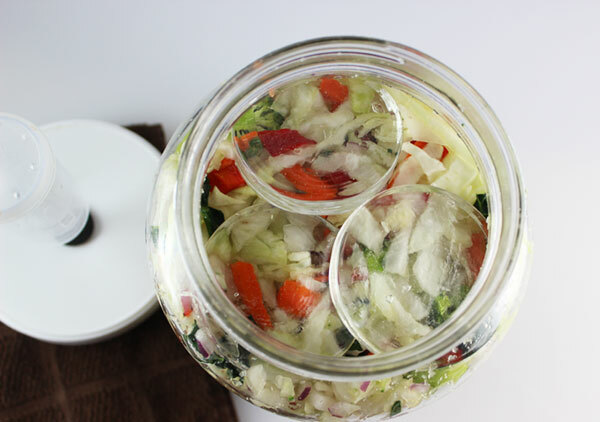 Fermenting vegetables also provides a delicious, savory soured taste, in addition to a softened texture, which can be eaten alone in small quantities or as a condiment with protein and starch-based meals to assist digestion. 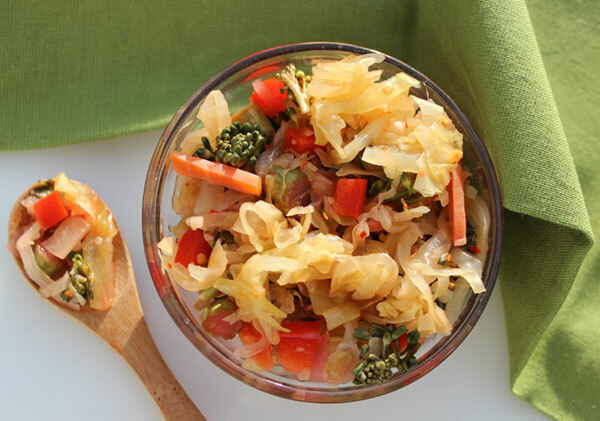 Both sauerkraut and kimchi are also examples of cultured vegetables that have been consumed by numerous nationalities worldwide for many centuries. 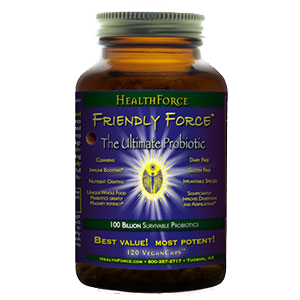 Contain probiotics helpful for increasing friendly gut flora. 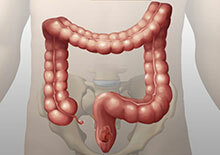 Act as a digestive aid and help to normalize bowel movements. Are a rich source of the immune boosting antioxidant vitamin C.
Are an alkaline-forming food after digested. 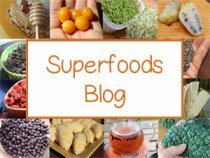 Full of living enzymes that help to breakdown other foods. 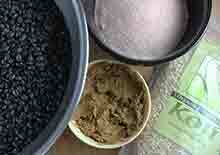 Helps to detoxify and clean the colon of undigested waste material. 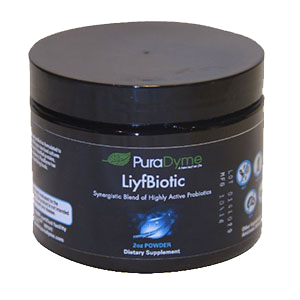 Bacterial action makes minerals more readily available to the body. 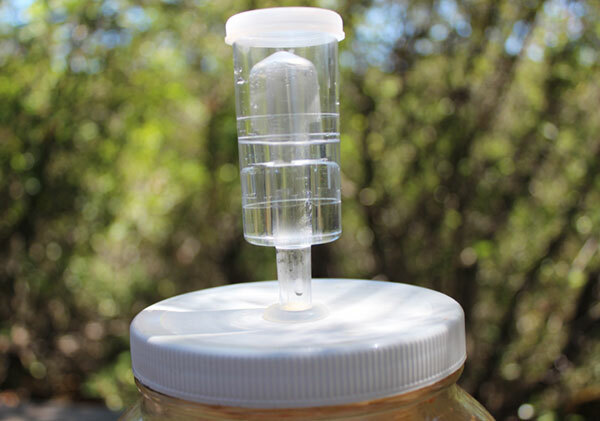 One of the best tips we can offer to those new to fermenting vegetables is to use an airlock cap. These are fermentation devices that allow gases to escape while simultaneously protecting other unwanted strains from entering in. They are inexpensive and can be obtained from several online suppliers. 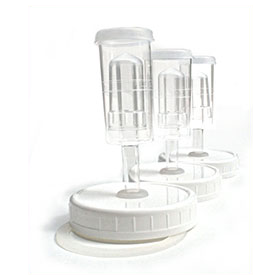 While lacto-fermentation is generally considered a very safe anaerobic process that naturally inhibits dangerous molds and yeast from contaminating the final product, airlocks are particularly helpful for keeping out surface molds that sometimes develop on the top where air exposure occurs. 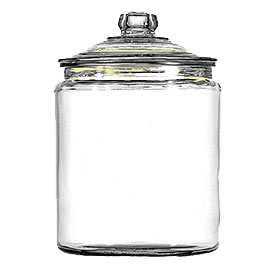 The reason why you don't want to tightly secure a lid is because of the potential buildup of gases that can cause the jar to explode. So, airlocks are a good alternative. They release CO2 gases but keep out any foreign airborne yeast or mold strains. 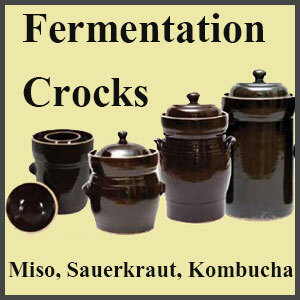 For many years we fermented vegetables using the tradition "wild fermentation" technique. Basically, protecting the jar with a cloth or loose lid. Now we always use airlocks. 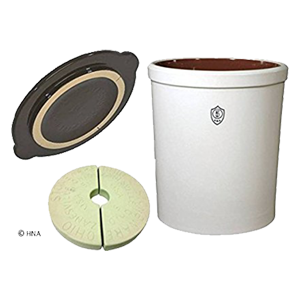 It's just simply more full-proof and enables you to control any potential mold growth that you may have to scrape off the top layer. 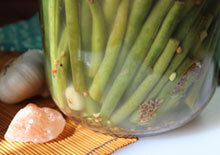 The vegetables need to be fully submerged with the brine liquid to culture effectively. 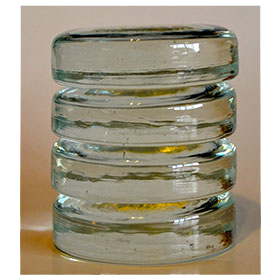 After several days, they can tend to float to the top of the jar leaving a space of liquid at the bottom. This is why most successful cultured vegetable makers use weights on top to prevent this from happening. 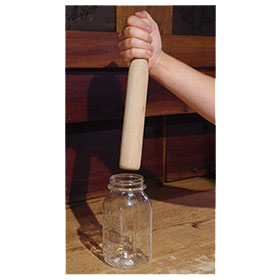 This can be a sterilized homemade weight of some kind or you can purchase glass or ceramic fermentation weights, also sometimes referred to as "crock rocks" or "pickle pebbles." We usually place our cleanly washed weights directly on top of the tightly packed vegetables. 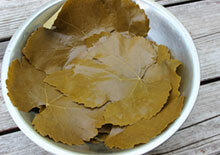 On top of this, we place a few folded cabbage leaves. 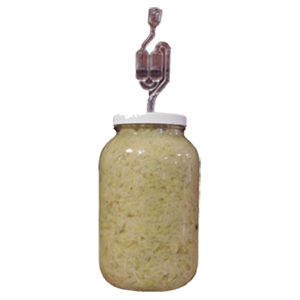 There are many probiotic powders and sauerkraut-specific culture starters you can add when creating the brine liquid. 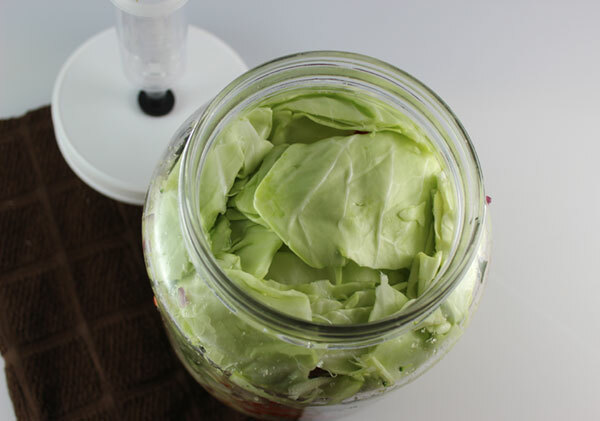 While not completely required, as cabbage and other vegetables naturally have lacto-bacteria present, they do really help to encourage greater probiotic activity especially at the beginning stages of fermentation. 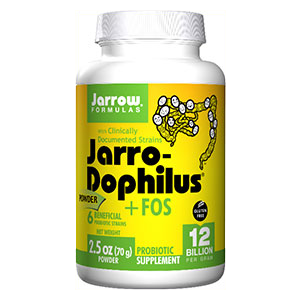 We usually use probiotic supplements like acidophilus or varieties with other hardy lactobacillus strains. 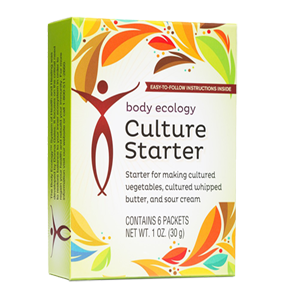 The brand Body Ecology also has their own culture starter. A box contains 6 starter packets. One packet is good for 6 quarts of homemade cultured vegetables. For this cultured vegetables recipe, you can of course substitute other vegetables you happen to have in your fridge. Just replace the proportions used in the ingredients list with others you may need to use up. 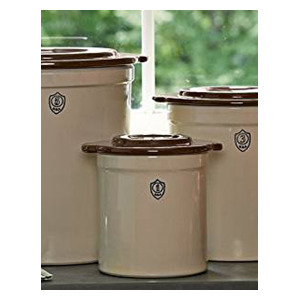 Most all vegetables can be fermented (with the exception of potatoes, squash and other starchy roots), so you can pretty much use whatever you'd like. We always recommend using the highest quality produce and organic, non-GMO ingredients. In addition, it is essential that all vegetables are cleaned well and that all tools, chopping boards and jars have been thoroughly washed in hot soapy water. This recipe is for a half-gallon glass jar and, in the end, will make approximately one and a half quarts of fermented vegetables. Take 3/4C of filtered water and blend or process with about 1/2C chopped cabbage, 1/2t probiotic powder, 2t lemon juice and 1t sea salt. 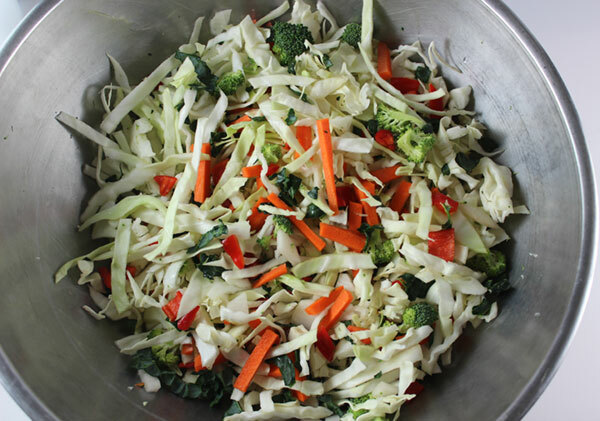 Chop your cabbage into long pieces and add to a large mixing bowl. Blend a brine using the instructions above and set aside. Chop, dice or slice all vegetables, providing desired bite-size pieces. Alternatively, you can also use a food processor for this procedure for one or all of the ingredients listed, but you will lose texture value. Mix the chopped cabbage and veggies together. 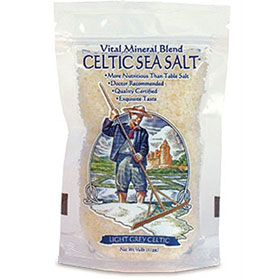 Mix the brine liquid with this vegetable mixture. We traditionally do this with cleanly washed hands, slightly squeezing the ingredients as we toss them around. Leave covered with a clean cloth for 15 minutes. This will allow the ingredients to extract their own natural juices. 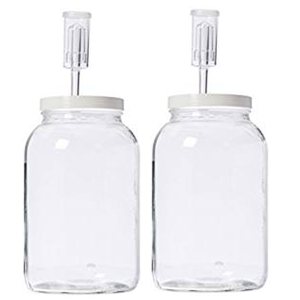 Pack tightly into a pre-washed half-gallon size glass jar, pushing down firmly with the back of your clean hand, leaving a one-inch space at the top. Place your weights if you are using some. We usually place about three glass fermentation weights on top. Add a few rolled cabbage leaves on top. They do not need to be submerged in the brine. 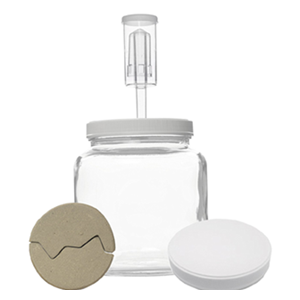 Place a lid with an airlock device or alternatively use a loose lid or cover with a clean cloth secured with a rubber-band. Store in a cool dry dark location for approximately 7 days. 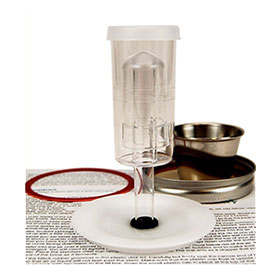 If temperature is warmer than 72°F, it will take less time to ferment and likewise if it is cooler than 67°F, it will take more time to ferment. Taste test after 5 days to see how you like it as some people prefer a crunchier texture. We personally prefer a 7-10 day process. 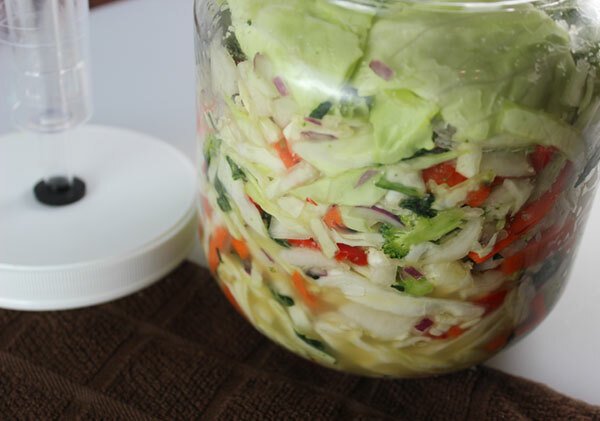 To stop continued fermentation, store your vegetables in the refrigerator in a jar with a lid. 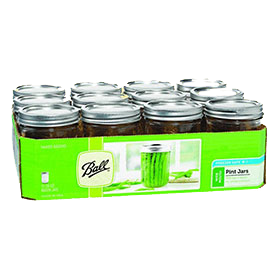 As this is a natural way to preserve food, they will have a very long shelf-life when stored appropriately. Incidentally, a cultured vegetables recipe is great to create in bulk quantities with a group of friends. It can be a very communal and fun way to spend time together, chopping and packing up your ferments into glass jars that everyone can take home and experience. 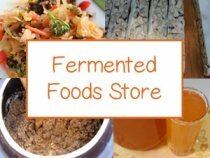 People who have allergies to mold should avoid consuming homemade ferments or seek the advice of your healthcare provider before consuming any fermented food.